It was sixty years ago on 4 October in 1957 that the Soviet Union launched Sputnik, the first man-made object placed into orbit around the earth. While our Inspirational People segment usually concentrates on an individual or a couple, this time we’ll be looking at several astronauts and whether we know if their travel into space had an impact on their beliefs if any, about God, or if those who had a faith were affected by their venture into that mysterious territory. I imagine that it must be a humbling experience to see oneself in that huge, cold emptiness and to recognise for the first time, one’s utter insignificance in the face of it. For those astronauts who founded their belief and sense of self on evolutionary theories, it would surely have made them feel not only infinitesimally small, but possibly completely irrelevant. For the Christian adventurer though, their realisation would possibly have been a complete contrast. While realising their insignificance, there might an acknowledgement of the magnificence of our Creator and a astonishment and wonder as to why He should care for them. 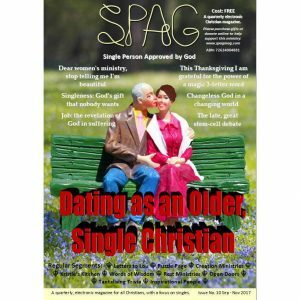 For Christian astronauts who saw themselves for the speck they truly are in the face of God and His incredible creation, that knowledge might enable them to more fully comprehend how extraordinary it is that God should still choose to bestow His love on us and desire to forge an intimate relationship with us. By the 1950s, the antagonism between the Soviet Union and the USA resulted in an unofficial ‘space-race’ with each striving to achieve ‘firsts’ and thus prove they were superior to the other. The successful launch of Russia’s Sputnik and its orbit around the earth in 1957, caused escalating fervour in the USA. The government placed increasing pressure on its engineers and scientists to not only match the Soviet’s accomplishment, but to exceed it. 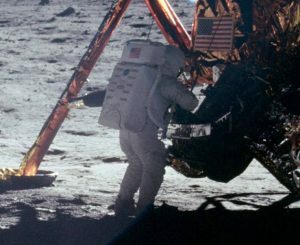 Around one year later on 1 October 1958, NASA first began its operations, but it was to be another eleven years before man would walk on the moon for the first time. 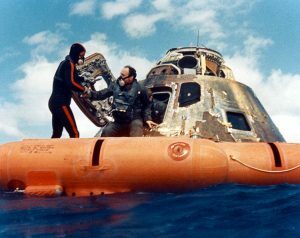 Aerospace technology in those early years was crude and particularly dangerous for the early astronauts, with engineers and scientists having to develop completely new concepts and technologies to meet the rigorous requirements of space-travel and to ensure the safety of its astronauts. 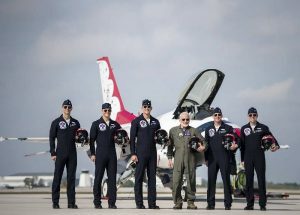 Since its inception, NASA has had around 320 of its astronauts spend time in space, though the number of Russian astronauts (cosmonauts) are as yet unavailable. 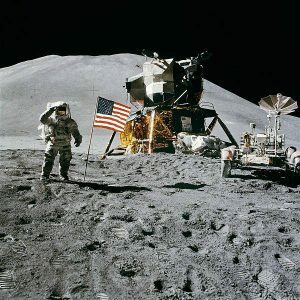 While there have been suggestions that the number of Christians in the American space program over the years, was significant, the statistics tell us otherwise. 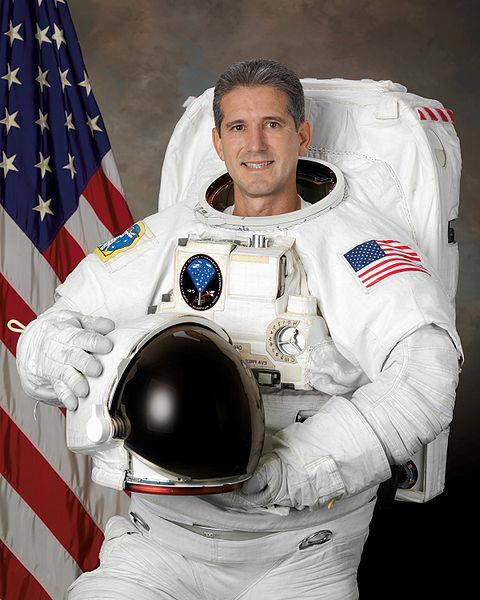 While there have been around seventeen Christian astronauts, if we compare that against the total number of NASA astronauts who have spent time in space, that makes it a total of 17 out of 320, which is just over five percent. 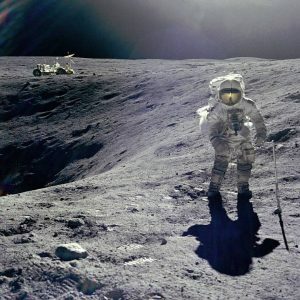 What is significant though is that there have been a number of non-Christians and non-religious people, who have shared that they had a spiritual experience while in space. If we consider the era in which the first American astronauts grew up who were sent into space (from 1940s to 1970s), it’s not surprising that so many of them had a Christian faith or had their faith renewed by their space-faring excursions. More people went to church in those eras then they do in the present day, and Christianity was recognised and embraced as one of the cornerstones of western society. On 21 July 1969, the second man to walk on the moon was Buzz Aldrin. Edwin Eugene Aldrin Jr, was a committed Christian. A former US Air Force officer, he held a Bachelor of Science degree in mechanical engineering, Aldrin had flown as a jet fighter in the Korean war. 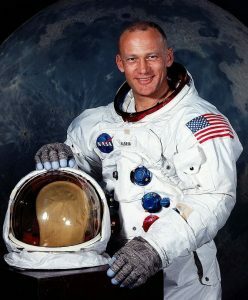 Buzz Aldrin in 1969, was the second man to walk on the moon, and the first Christian to set foot on soil other than earth’s. 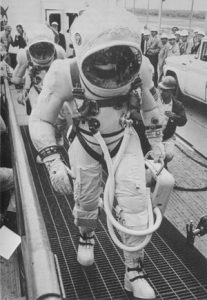 In 1966, while training, Aldrin was confirmed as an astronaut on Gemini XXII (12), which was to be the last of the Gemini missions. Gemini XXII was the tenth manned flight and the eighteenth manned space-flight. 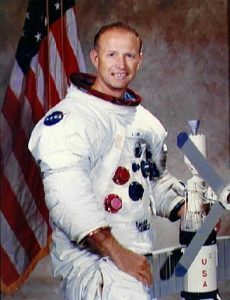 It was during that space flight that Aldrin first proved it was possible to work outside the space-craft (EVA – extravehicular activity). 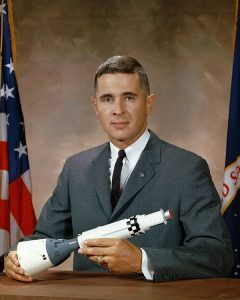 NASA began the next space-crafts, beginning with Apollo 1 which was a much more complex and advanced craft than the earlier Geminis. Unfortunately all three crew members died from a cabin fire onboard the Apollo 1, during a launch rehearsal test. The heat and dense smoke from the fire hindered all efforts to rescue the three men. Manned flights were suspended for around twenty months while NASA looked into the hazard problems. There was no Apollo 2 or 3 launch, though later the Apollo 4, 5 and 6 were successful unmanned test flights to determine the craft’s viability. 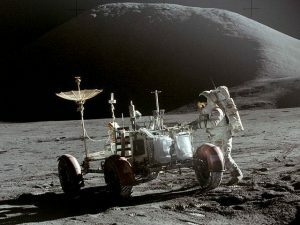 This gave NASA the confidence to continue using a similar vehicle. In October 1968, Apollo 7 took a crew into outer space. 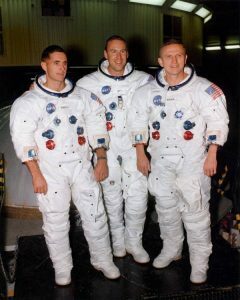 This successful mission, encouraged NASA to undertake Apollo 8 in December 1968 which was to orbit around the moon and return to earth. On Christmas eve, while in space, the crew members of Apollo 8 read the first ten verses from the chapter one of Genesis which was broadcast to a then record TV viewing audience. “In the beginning, God created everything: the heavens above and the earth below. Here’s what happened: at first the earth lacked shape and was totally empty, and a dark fog draped over the deep while God’s spirit-wind hovered over the surface of the empty waters. Then there was the voice of God. God: Let there be light. And light flashed into being. God saw that the light was beautiful and good, and He separated the light from the darkness. God named the light “day” and the darkness “night.” Evening gave way to morning. That was day one. 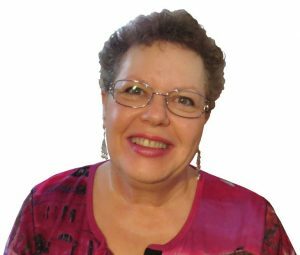 God: Let there be a vast expanse in the middle of the waters. Let the waters above part from the waters below. So God parted the waters and formed this expanse, separating the waters above from the waters below. It happened just as God said. And God called the vast expanse “sky.” Evening gave way to morning. That was day two. God: Let the waters below the heavens be collected into one place and congregate into one vast sea, so that dry land may appear. 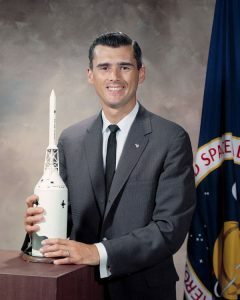 It was that Bible reading on Apollo 8, which led to NASA being sued by atheist Madalyn Murray O’Hair for NASA’s religious use of the space program because they had allowed the astronauts to read the Bible during a space flight. 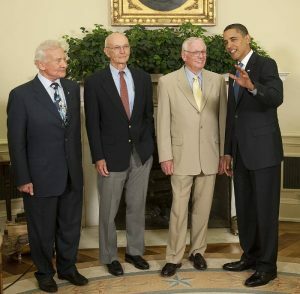 While O’Hair lost the case, from that time on, NASA sought to distance itself from promoting any particular religion, and specifically requested that the crews not make any religious quotes. 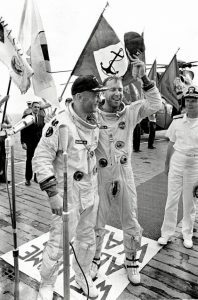 Apollo 9 and 10 did further tests in space to determine the viability of a moon landing, its engines, life support backpacks, docking man-oeuvres, navigation systems and more. Then it was time for the real thing – Apollo 11. 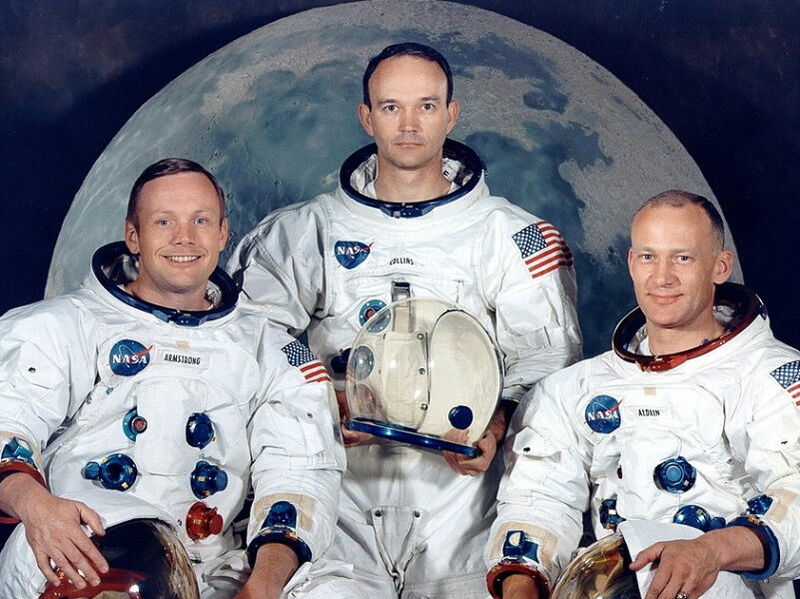 The rocket was successfully launched, and three days later, while Michael Collins waited in the Apollo 11 command module, on 20 July 1969, Neil Armstrong (commander) and Buzz Aldrin (pilot) became the first two human beings to land atop and set foot on earth’s moon. While Buzz had initially desired to be the first out of the craft, NASA determined that it would be much easier for Armstrong to go first, due to their physical positioning within the craft, and also as Mission Commander, it was Armstrong’s privilege to be the first. 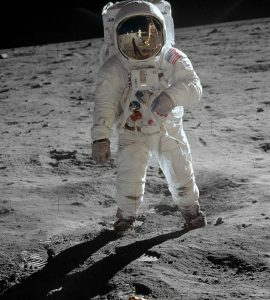 What few people know (and certainly NASA doesn’t promote it) is the fact that Buzz Aldrin, a Presbyterian, held the first ever communion on the surface of the moon. He’d brought with him a tiny communion kit that had been given to him by his pastor Rev Dean Woodruff. After he left NASA in 1971, Buzz retired in 1972, but struggled with depression and alcoholism and eventually sought treatment which helped him tremendously. He continues to promote the exploration of space. 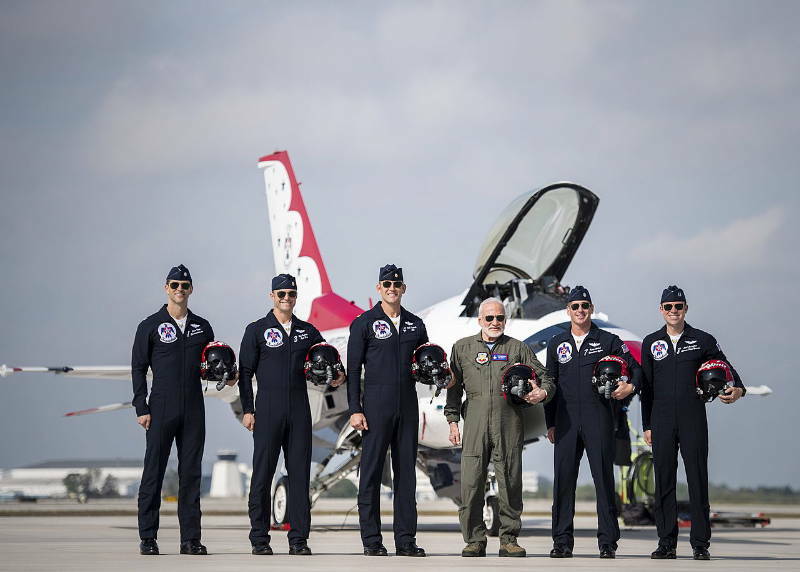 In 2016, at the age of 86, he gained the world record for being the oldest person to ever reach the South Pole. Additionally, Aldrin has co-authored around nine books. 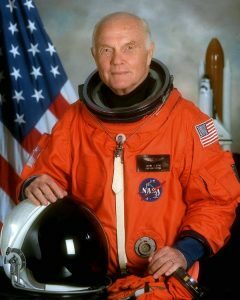 John Glenn in 1988 was one of STS-95 crew and at 77 was the oldest person to fly in space. Jeffrey is a committed Christian. 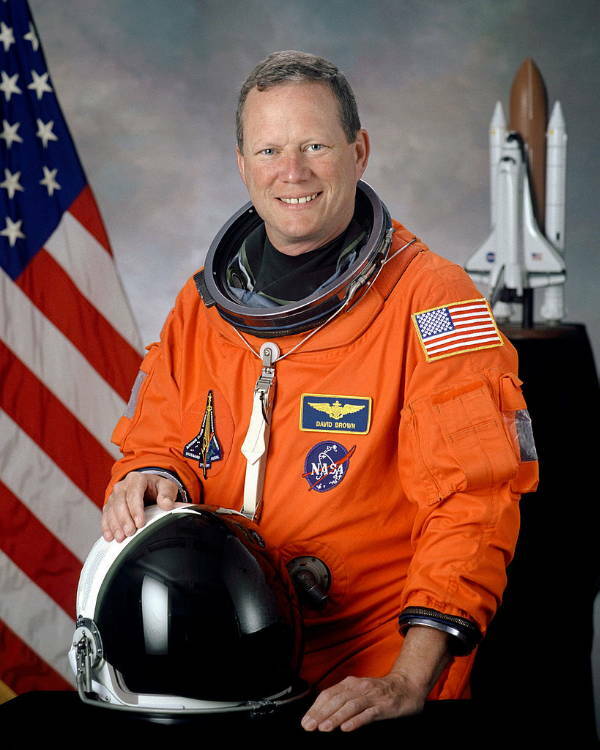 His first space flight was in 2000, and he has taken four space flights. 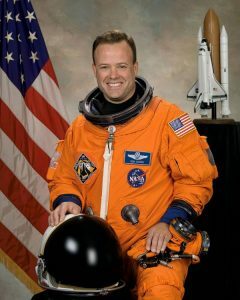 He holds the USA record for the most time spent in space and has taken more photographs in space than any other astronaut. 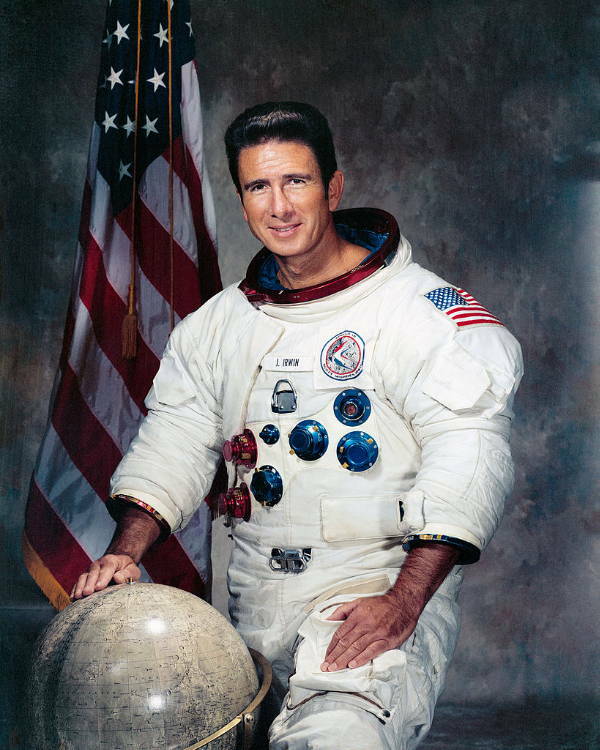 Irwin was a lapsed Christian before he went into space and was on the fourth manned ship to reach the moon. His wife was a believer. 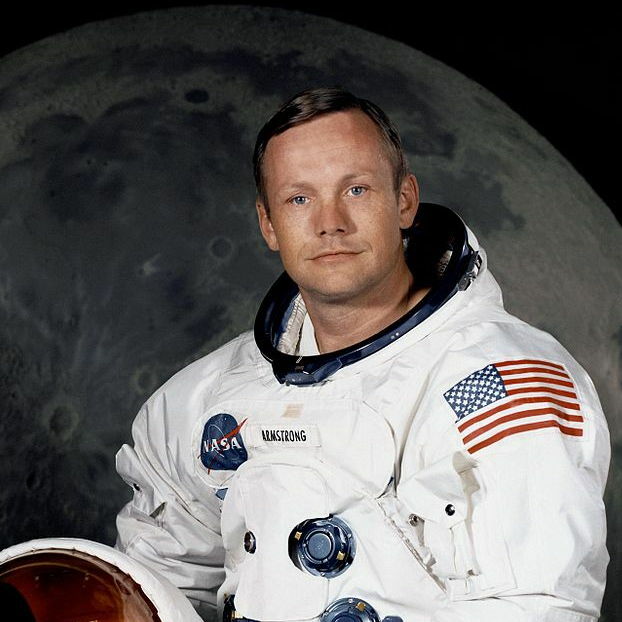 It was while he was on the moon that he encountered God in such a way, that it changed his life forever. After that, Jim felt God calling him to tell people about Jesus. 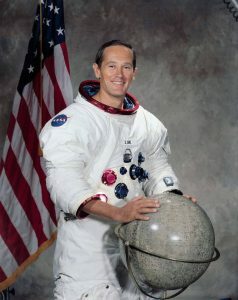 Irwin said of his experience while on the Apollo 15 lunar mission. 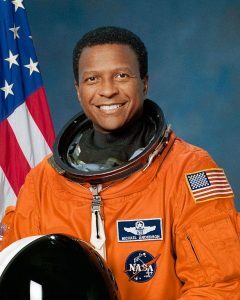 One year later he quit his aerospace job and founded the High Flight Foundation (an interdenominational evangelical organisation) and later became an evangelical minister. With his pastor, he set up “High Flight,” a non-profit organisation which provides religious retreats as well as tours to the Holy Land. He frequently spoke about how his experiences in space had made God more real to him than before. Beginning in 1973, Irwin was the leader of a couple of expeditions to Mount Ararat, Turkey, in an attempt to find the remains of Noah’s Ark. In his book, “More Than Earthlings,” Irwin shared that he believed the Genesis creation was real, literal history. 4. 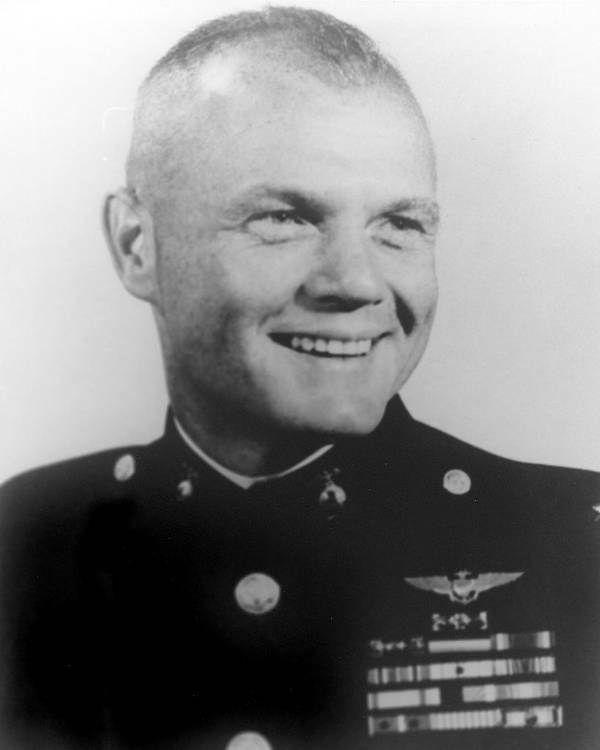 William Alison “Bill” Anders (born 1933). 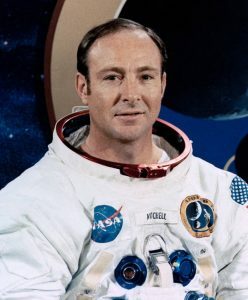 During the Apollo 8 lunar orbit, on Christmas eve in 1968, the crew took turns reading the first ten verses of chapter one of Genesis, and Anders was the first to begin the recitation. It had been his choice to do that, not out of a sense of piety but because he thought it was a universal idea, that we were all created. 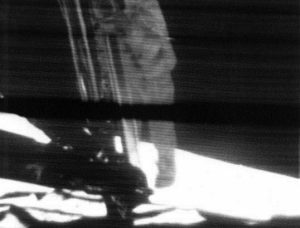 The reading of the Bible verses was recorded by NASA, but wasn’t something that the space agency promoted. 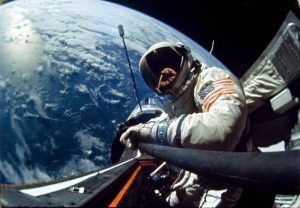 Anders was touched deeply by his space experience, coming to recognise mankind’s insignificance in the vast expanse of space. 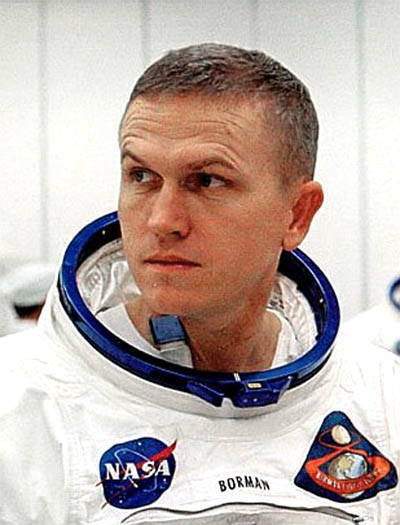 The commander of the first crew to fly beyond the earth’s orbit, was Frank Borman. 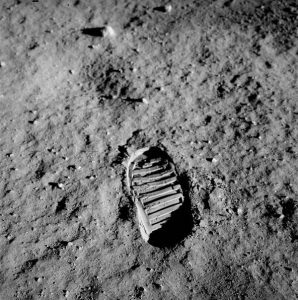 As he looked down towards the earth some 250,000 miles away (402,000km), he quoted Genesis chapter one on the radio. 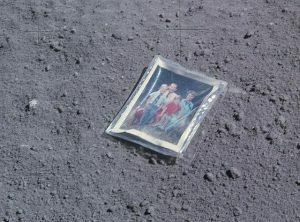 Charles Duke left behind his family’s photo on the moon in 1972. 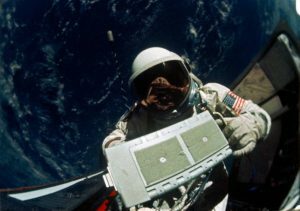 He’d taken it on board despite NASA’s strict requirements on extraneous items. 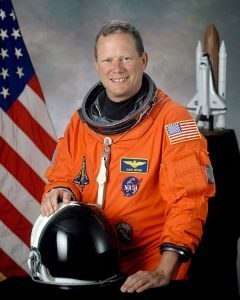 Guy is a former astronaut who shares a testimony in different churches about the reality of God. 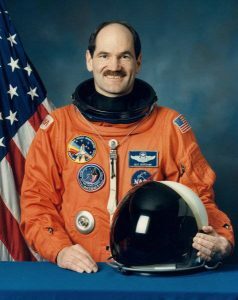 A Catholic man who through his experiences in space, and the remarkable views that he saw, had his faith in God further cemented. Ronald teaches Sunday School and is a Catholic. 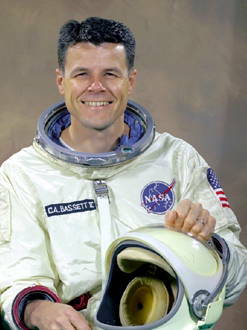 Prior to his space flight, he asked a group of Carmelite nuns to pray for him. He asked if they had an item he could take into space with him, so the sisters provided a relic of St Thérèse of Lisieux. Ronald is also the founder of the Manna Energy Foundation, which finds ways to assists villages in Rwanda to make potable water. Ronald J. Garan Jr first flew in space on the STS-124 mission to the International Space Station and later spent six months there in 2011. 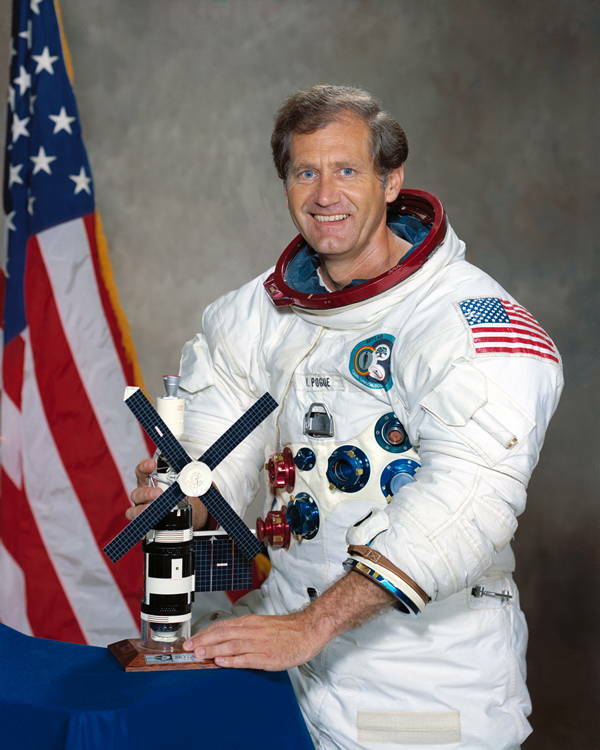 Commander of Skylab 4 from 1973 to 1974, Carr has been a regular church attendee. Charlie was a regular church attendee before his death. 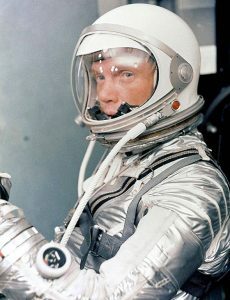 He was assigned to Gemini 9 in 1963 but died in an airplane crash in 1966 during training for his first spaceflight. Chaffee was a regular attendant at his church before his death in a pre-launch test for the Apollo 1 mission. Roger Chaffee on far right, Gus Grissom left and Ed White middle in front of Launch Complex 34 which housed their Saturn 1 launch. 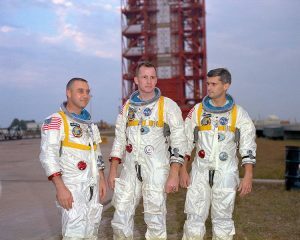 All three died in a cabin fire in the rocket in 1967. He was the Pilot of Skylab 4, the third and final manned visit to the Skylab Orbital Workshop, 1973-1974. 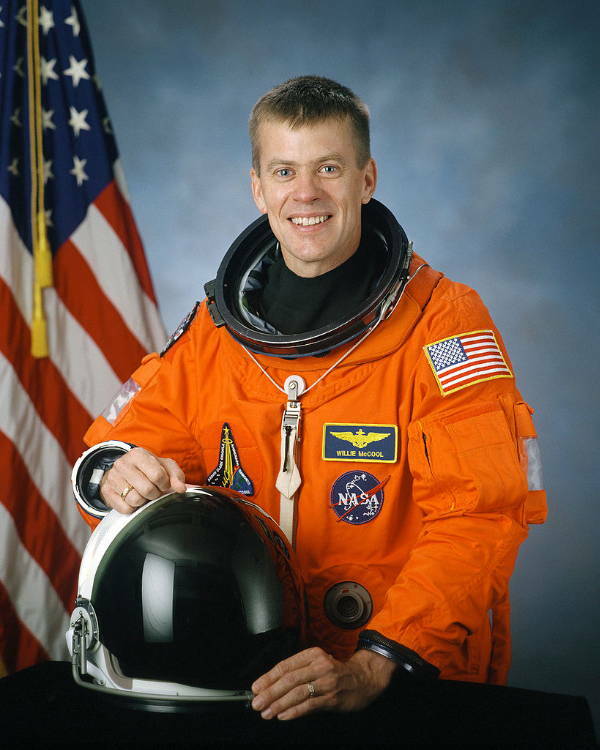 A conservative Christian, Anderson died in the Columbia shuttle disaster. David also died in the Columbia shuttle disaster, and had been a lay volunteer at his church. An active Christian in his church at Clear Lake, Husband died in the Columbia shuttle disaster. McCool died in the Columbia shuttle disaster. 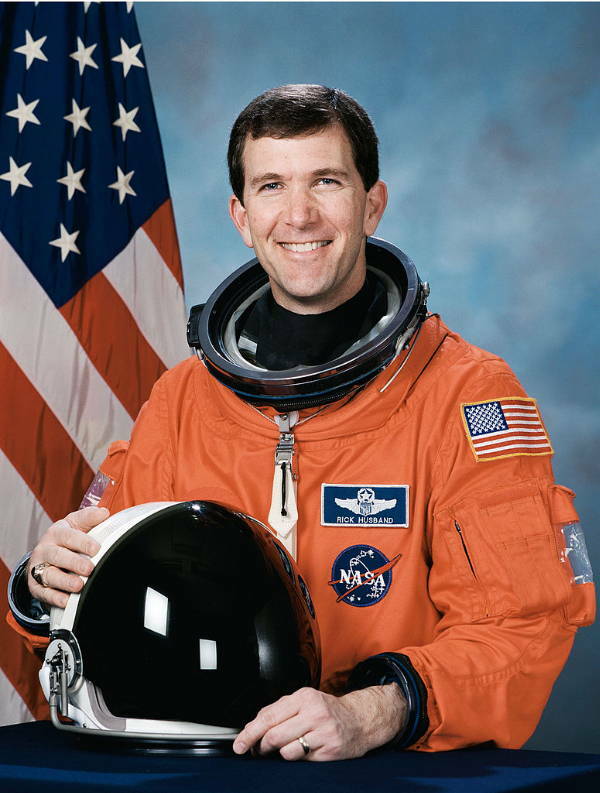 William C. McCool was the pilot of Space Shuttle Columbia mission STS-107. 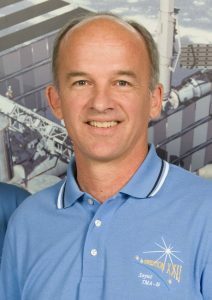 According to Jomar Teves of iTechPosts, Russian astronauts (Cosmonauts) have been known to take along a Russian Bible into space with them, as well as stone relics that were claimed to have come from Mt Thabor, where Jesus appeared to some of his apostles just before being taken to heaven. Several other astronauts have had spiritual experiences when in space though not necessarily Christian, including Gene Cernan, Anousheh Ansari, Nicole Stott, Jeff Hoffman, Shane Kimbrough as well as Edgar Mitchell, who was part of the Apollo 16 expedition. 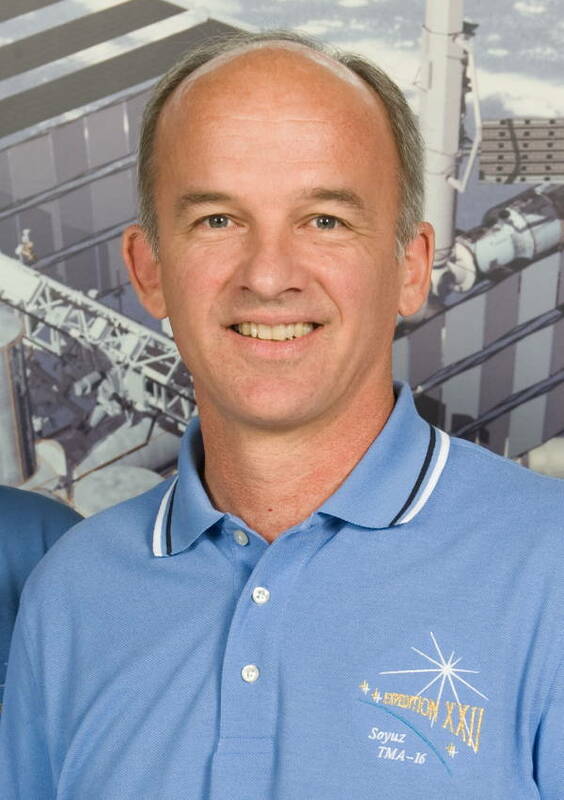 According to Huffington Post’s Dominique Mosbergen, Canada’s astronaut Chris Hadfield had such an intense spiritual experience that it changed his perspective on life. 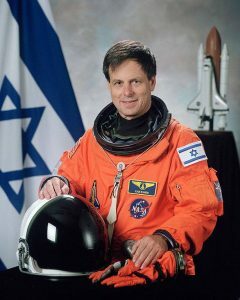 Ilan Ramon, an Israeli astronaut, took a copy of the Torah on microfiche aboard the ill-fated space shuttle Columbia. According to the Jerusalem Post he also took his diary into which he’d recorded the Jewish blessing ‘Shabbat Kiddush’ so he could broadcast the blessing back to earth. 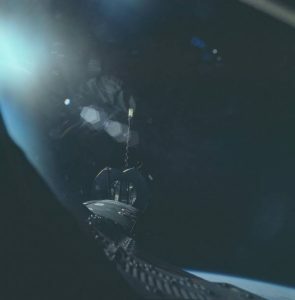 Astonishingly, after the shuttle disaster, almost forty pages from Ramon’s diary were found to have survived the fiery explosion, and there’s no logical explanation for it, and later the pages were passed onto his wife. When it came time for man to take a small step from earth into the heavens, God was already there. He used opportunities not only for believers to share His message to the world, but to speak of Himself on a personal basis to many who ventured out there into the cold, unwelcoming endlessness of space. There He shared with them, the warm, loving embrace of His arms, particularly those who never made it back to earth, those who went from being in outer space one moment, and far beyond it in the next. 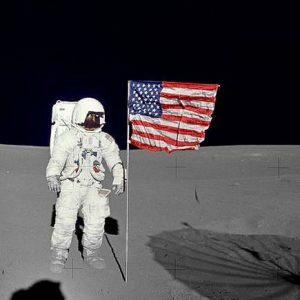 To view the recording of the first landing on the moon, go to: www.hq.nasa.gov/alsj/a11/video11.html#Landing.